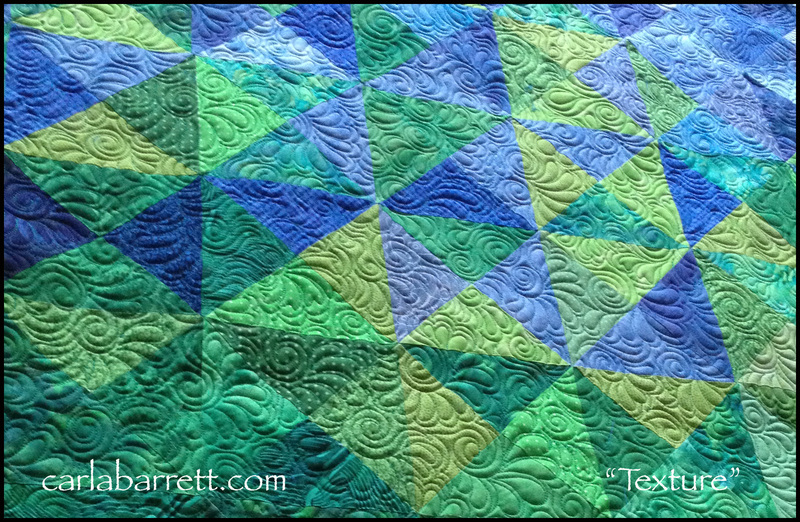 I wanted to talk a bit about my design approach to a color blocked modern quilt by a wonderful person named Lyn Baker. Lyn is the binding queen and personally responsible for improving my binding technique. Lyn’s quilt may be purchased in kit form from High Sierra Quilters here. If interested, call Doug at the store and he will help you. 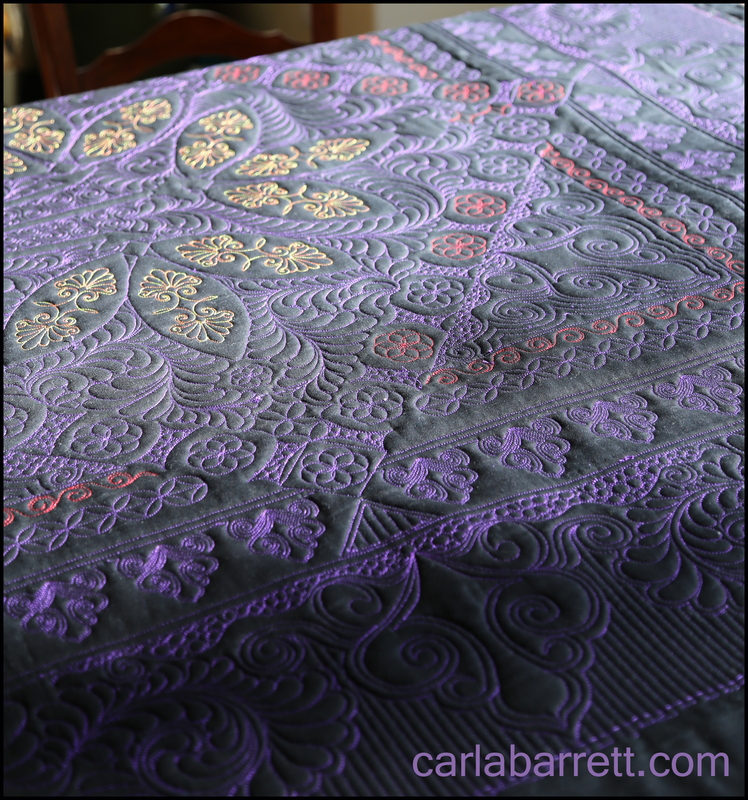 With Lyn’s quilt, I wanted to maintain the color blocked areas and simply enhance this quilt with some fun and interesting texture. I purposely chose the thread to match each colored fabric area, meaning I had LOTS of thread changing as I worked. The reason for this is to provide texture and let the geometric visual in the piecing and color become the star of the show. The quilting merely enhances the piecing and provides a layer of interest to the viewer as they see the quilt up close. If I had chosen contrasting thread, it would fight the piecing- and in not a good way. Choosing thread with intent is something I love to do. 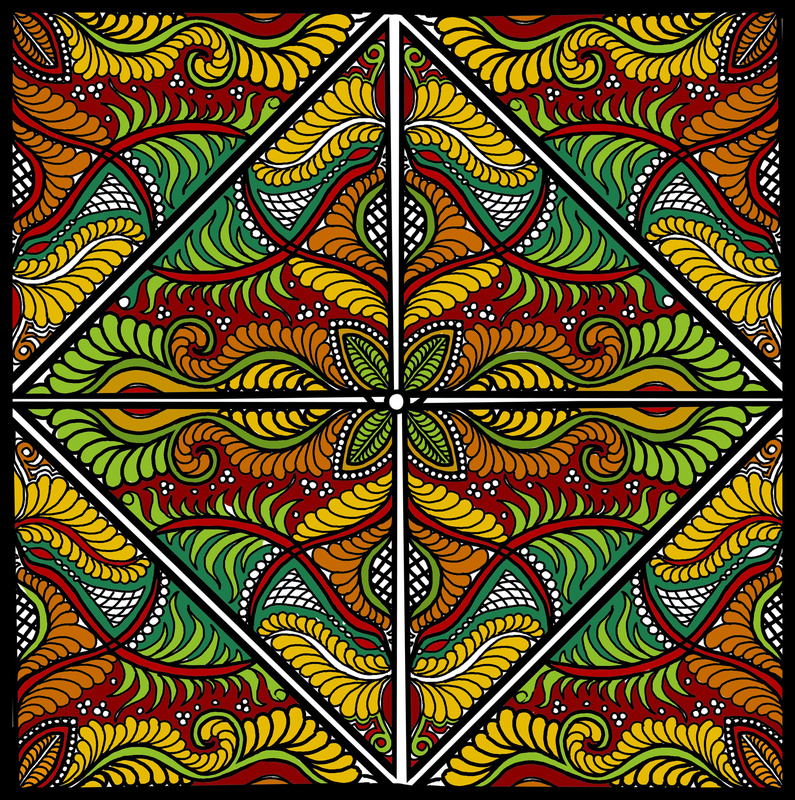 Many of the designs you see above are also repeated throughout the quilt, too. 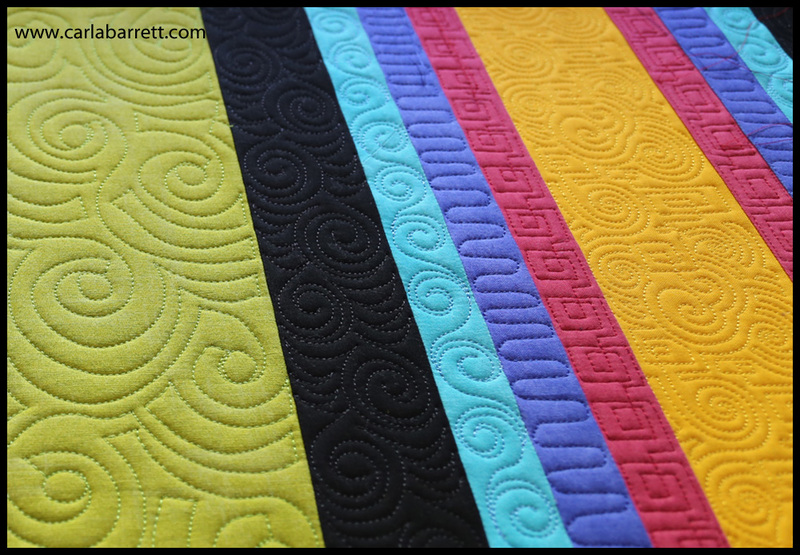 Repeating designs is a great way to bring cohesiveness to your machine quilting designs, especially with modern quilts. All the quilts I do have a nice mix of freehand designs, usually an original design thrown in, and also some commercial digitized designs. In this quilt are some wonderful modern digitized designs by a variety of artists, including Janet Lee Santeusanio, Jessica Shick, Krista Withers, Jodi Robinson, and a few others. Not every area has to be quilted with fancier texture. 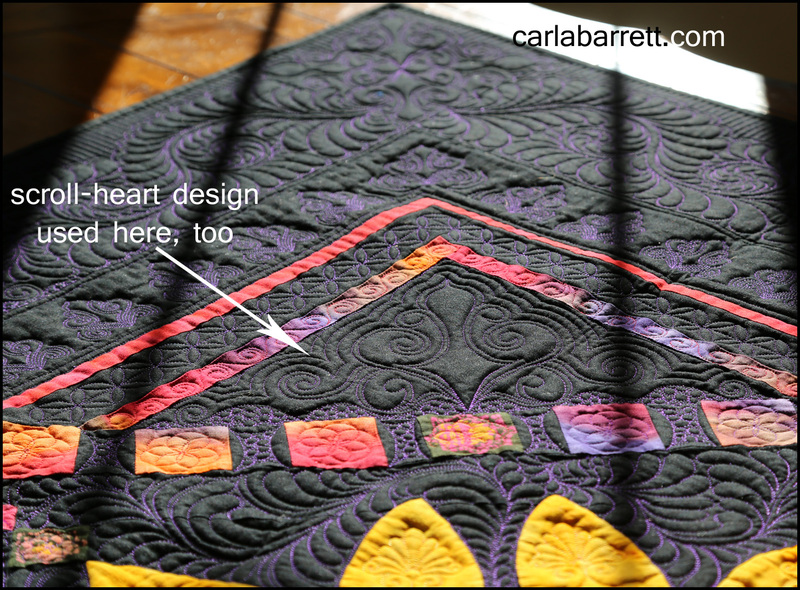 Note the simple freehand quilting in the detail photo, above, in the red and blue areas. 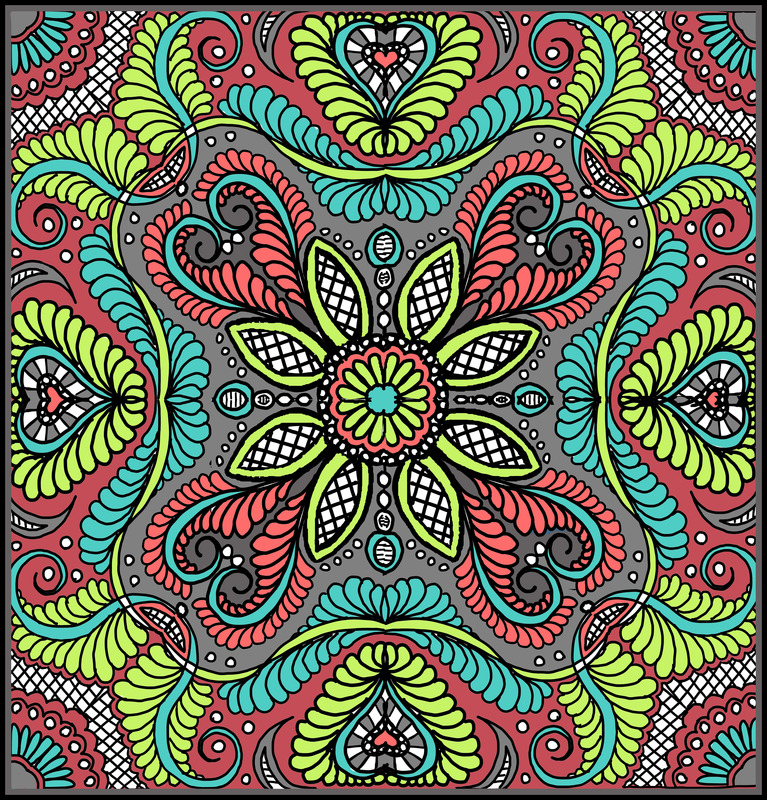 There is also freehand quilting in the black area, light blue, and the green area, as well. Notice that I also varied my quilting density, though the overall quilting is balanced. This was done for added interest, as well. Whenever I have a free moment, I like to get out my tablet PC and draw class samples. 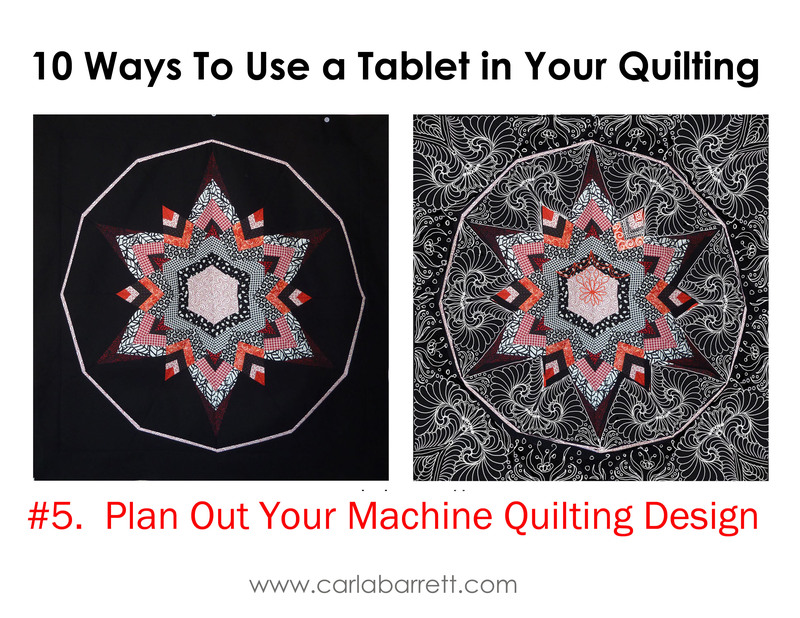 In this case, I was drawing digital quilt examples for a class I am teaching in AU later in the year. Many of you know my good friends, The Pixeladies. Deb Cashatt and Kris Sazaki are amazing artists, authors, and instructors- and they are coming LIVE to a venue near you in 2014. The Pixeladies extensively use Photoshop and technology in their work. Now you can learn these same skills from them at a workshop. 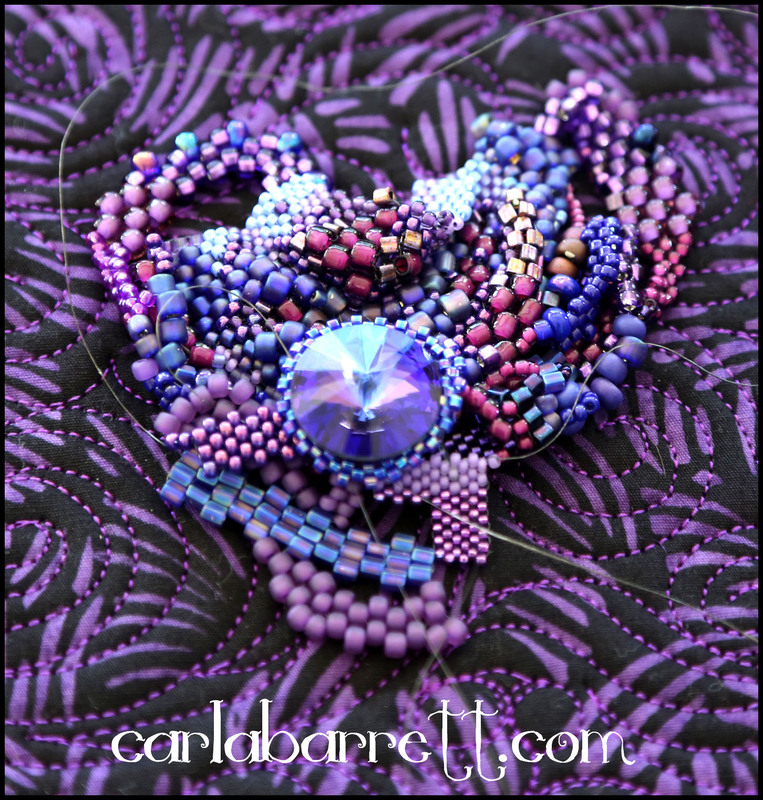 Can you imagine spending two, three, or four days learning all the great ways you can use Photoshop in your sewing, quilting, and crafting projects – and with the best two Photoshop instructors available? Deb and Kris can translate Photoshop speak so you will get the most out of the class. You can find more details on their website HERE , plus see more of their amazing text quilts, which is a technique unique to The Pixeladies. Just a quick message to let everyone know about upcoming eClasses I have scheduled for early 2013. 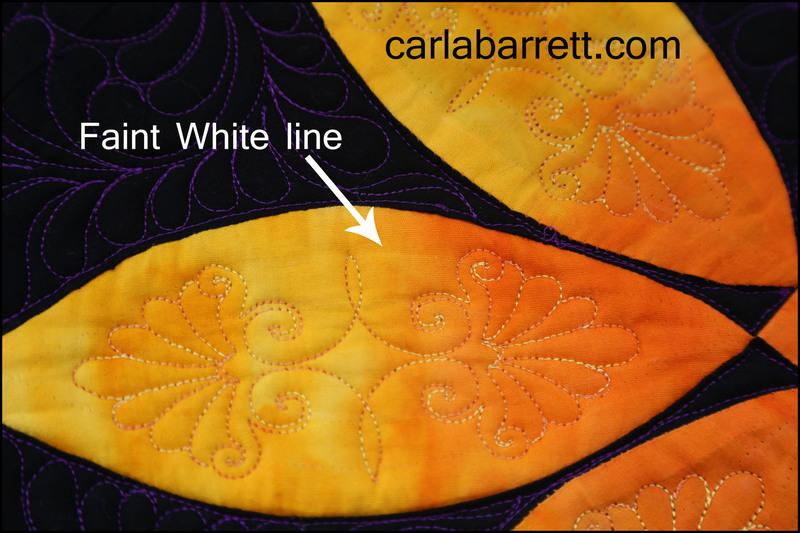 Quilt Whisperer eClass by Carla Barrett– This class is all about learning Carla’s unique approach to how to design quilt tops for machine quilting. 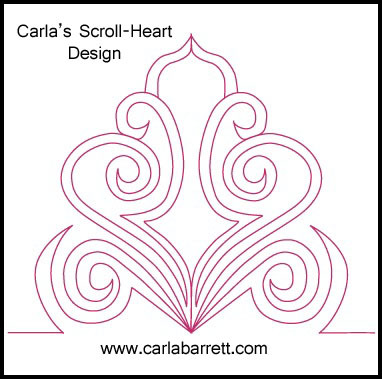 Also learn some of Carla’s favorite quilting designs and how to find your own inspiration! 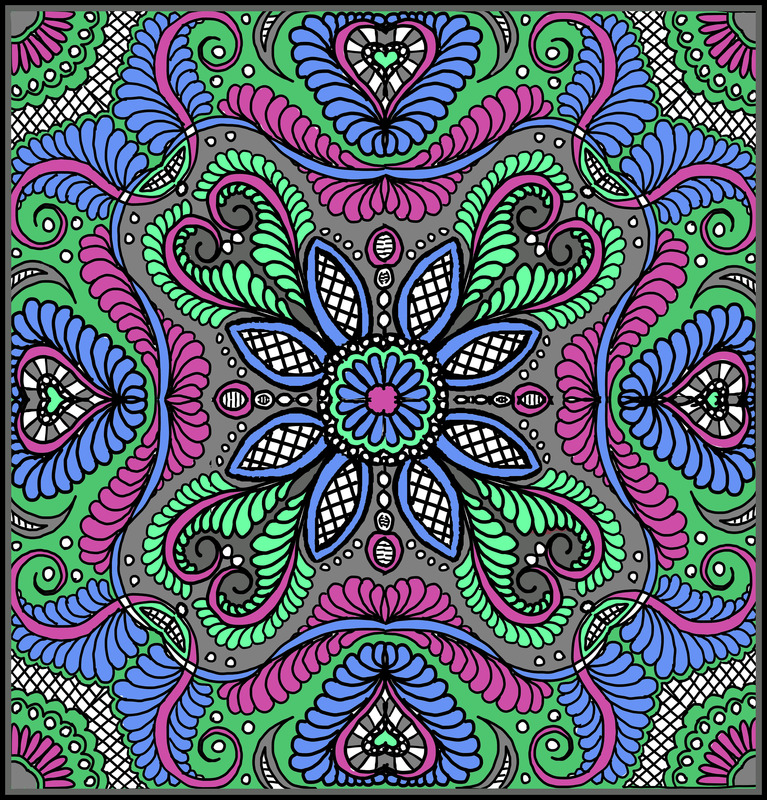 Fabric Design with Photoshop Elements* by The Pixeladies– The Pixeladies teach you how to design fabric for use in your art, art quilts and pieced quilts. 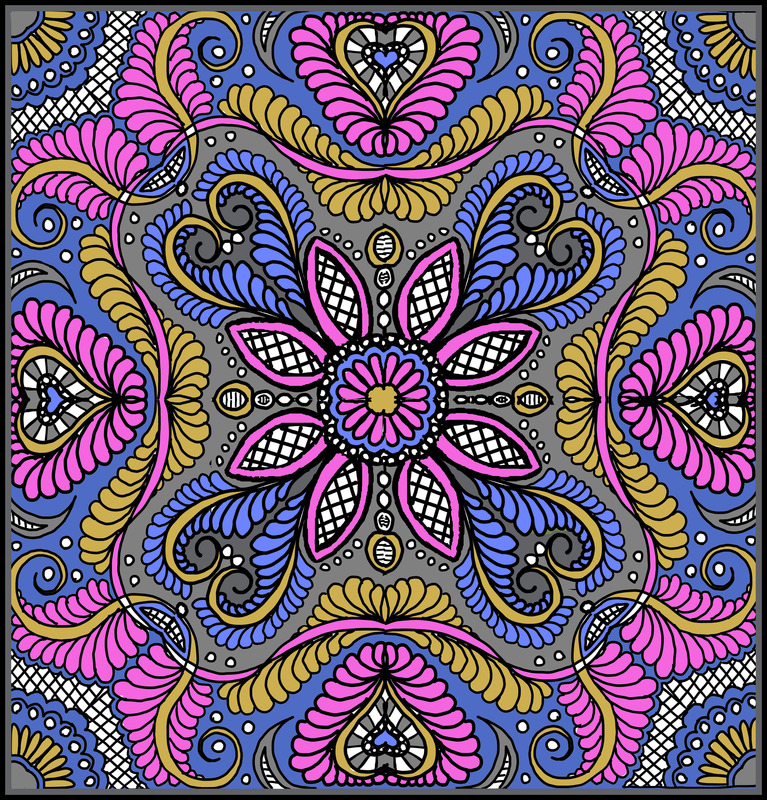 Tablet Design Class* by Carla Barrett- This eClass is jammed pack with methods for how to effectively use your tablet and PSE to design quilts, quilting, quilting motifs, zen doodle and more! *this eClass has a prerequisite of Beginning Photoshop Elements eClass OR basic knowledge of Photoshop Elements or PS CS. Side note- I decided to take a class break for this holiday season 2012 so teachers and students may enjoy their holiday season! Keep watching for when I finish scheduling the 2013 eClass dates! 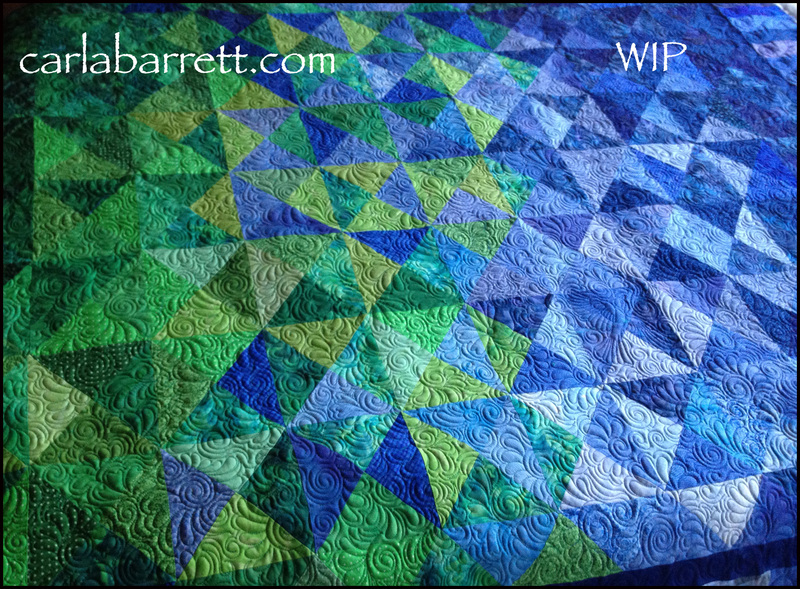 Of course, the next step is to freehand quilt some fills, which will be the finishing touch for this quilt. Oh yes, the outside border, too. I used designs from four designers- center is from Ronda Beyer, triangle design by One Song Needle Art, border 1 by Lisa Calle, corner motif by Kim Brunner, and outside border by Lisa Calle. As you can see, I am using my latest tool, (albeit an expensive one) my Intelliquilter, (IQ) and my designing skills with the IQ is improving. This is actually a trial piece before I do a larger project. That’s all from my studio today. Happy creating! 1.) Tree Overlay, made out of fiber, fabric and other embellishments, for my art quilt. 2.) Freeform Beaded leaves for quilt above. 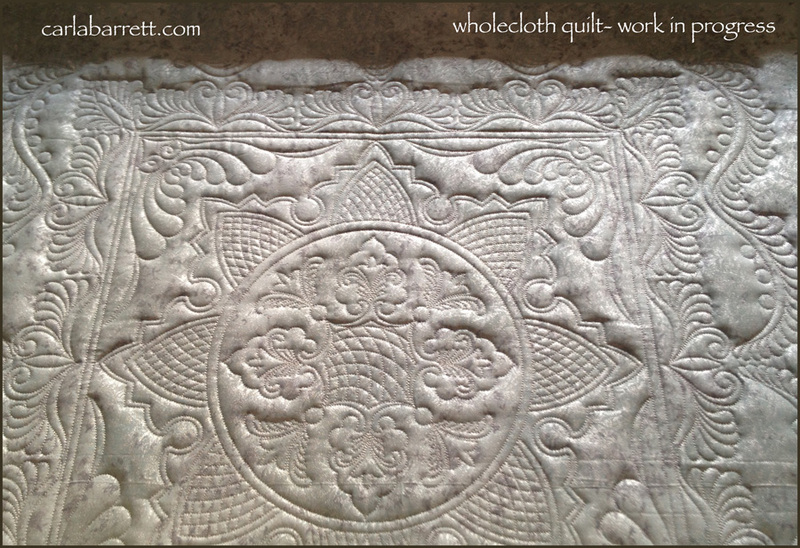 4) Wholecloth Series of Quilts. 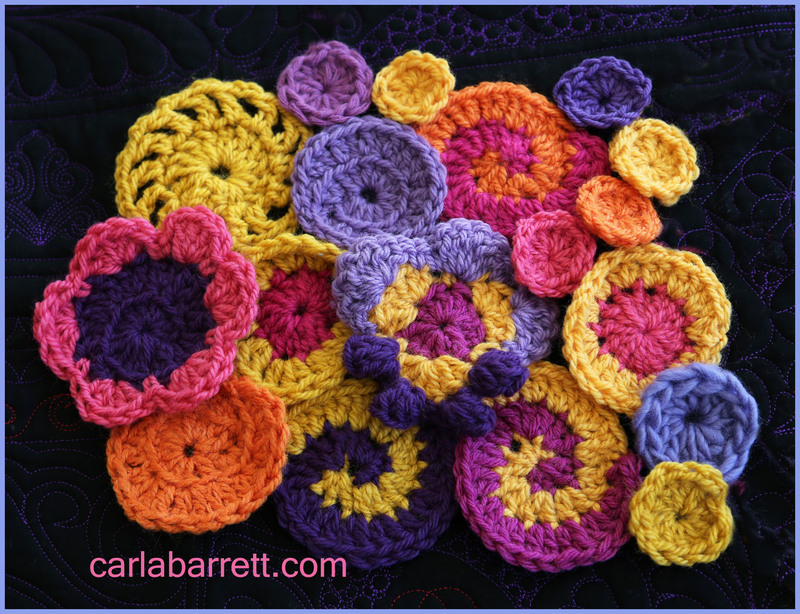 I am working on several designs on both silk, cotton, and whatever materials I find on hand. I promise to write about each project as it develops. Plus, I have some design projects in the works, but I can only share about that when they become available for sale. Baby-wise, dear little Ethan has been getting over roseola, which is a type of childhood virus featuring several days of a high fever, followed by a rash. Poor little guy, he has been feeling most crabby, but thankfully, has had no complications.